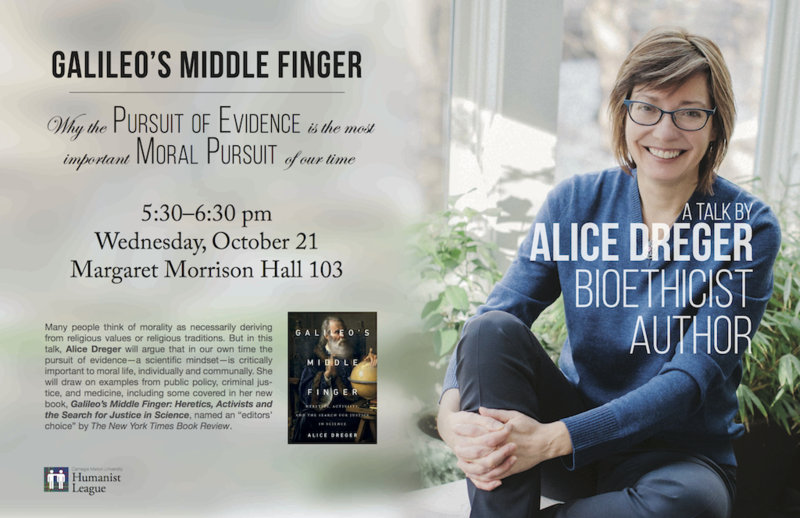 The Humanist League is proud to be sponsoring Alice Dreger, activist and author of Galileo’s Middle Finger: Heretics, Activists, and the Search for Justice in Science to speak at CMU on October 21st at 5:30 pm on “Why the Pursuit of Evidence is the Most Important Moral Pursuit of Our Time”! Many people consider the worlds of science and of morality to be totally separate. How can a purely observational method be applied to “shoulds” and “oughts”? Come find out! Alice Dreger will argue that moral truths can be derived from evidence, and a moral outlook can be constructed without any appeal to the supernatural.